May is much quieter as the South Africa marathon calendar revolves around Comrades qualification which ends on 1 May. 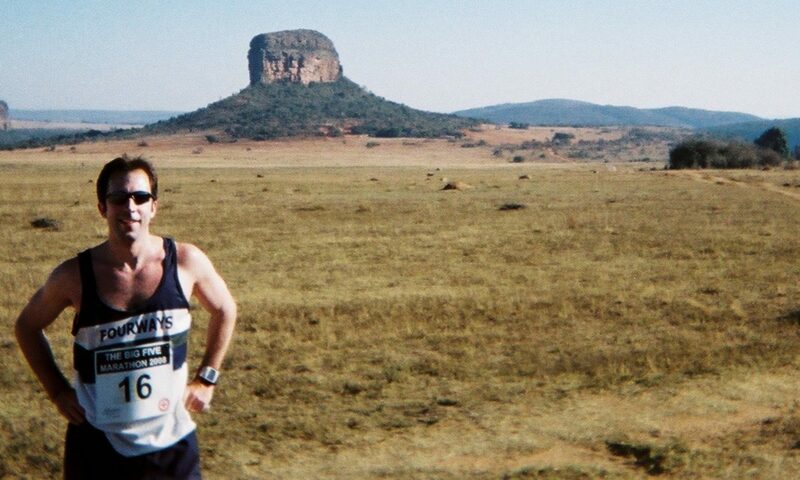 Note to the reader: I am writing a monthly article detailing all marathons and ultras on the South African running calendar which can be used as a definitive resource for the discerning marathon runner when picking their qualifiers and planning running holidays. Let me know if you have anything to add! For a fast time (those chasing a seeding): With a gentle uphill start (ensuring you don’t go out too fast) followed by 30km of steady downhill (with two speedbumps along the way), the Loskop 50k is a popular choice amongst the speed merchants. For those sticking to the marathon distance Wally Hayward, Durban City and Robor are good options for fast times. 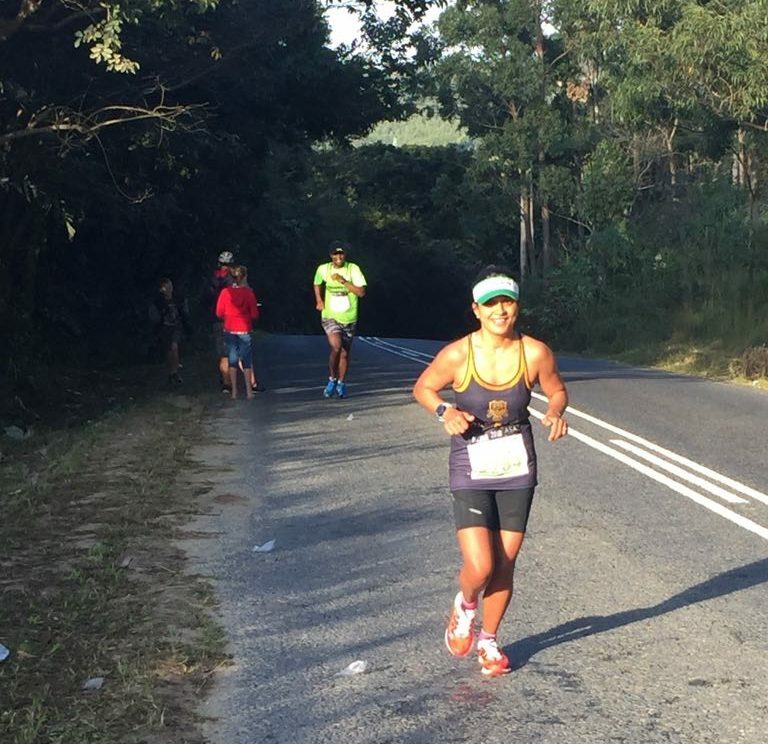 For a good time (marathons packed with personality): Take a trip to the Garden Route and run the Outeniqua Marathon from George to Wilderness. As beautiful, if not more so, than the Knysna Forest Marathon – and without the crowds. For a special time (hard to get to races that all ‘real’ runners should do at least once): My pick here is the Arthur Creswell Memorial 52k. Although not especially hard to get there from Johannesburg or Durban, race day logistics require a bit of planning as the route is point-to-point from Bergville to Ladysmith. This is one of the classics – chances are, if you get talking to a three-digit Comrades Green Number holder, they’ll ask you if you’ve ‘run Bergville’. For the first time (for those about to lose their marathon running virginity): The Wally Hayward Marathon has a great atmosphere and plenty of hardened marathon runners to pull you along and dish out the advice – but just be careful you don’t get caught up in Comrades fever and look for a June 9 substitution entry after the race! What I’ll be running this year: My 2nd Arthur Cresswell, 11th Loskop, 17th Two Oceans, 1st Pongola and 2nd Wally Hayward marathons/ultras. Race Description The race offers 52 countryside kilometres through northern Kwazulu Natal with enthusiastic support tables organised by the local community. Remember your warm top for the icy start in Bergville and your suntan lotion once the sun comes up – it’s a long, hot slog to Ladysmith. Those who enjoy a challenge (and a good view) will appreciate the stretch from 12 to 18km up Child’s Hill – the highest point on the route. Luckily the organisers leave the rest of this hill’s family out of it as you drop and undulate all the way home. To keep you on your toes, there is a tricky dirt road section towards the end of the route. The Bergville ultra features as the cornerstone of many KZN runner’s Comrades training plans. Why Run It? Run one of the classic South African ultras (the race turns 54 this year). For those who’ve never gone passed the marathon distance, this is an excellent race at which to pop the ultra cherry: Once you get to the marathon mark you can enjoy you first foray into ultra distance with 10km of (largely) gentle downhill all the way to the Ladysmith AC clubhouse. Race Description The is an out-and-back course with most of the route being run on good quality dirt road along the banks of the picturesque Wilge River. There’s a drop down to the river early on and a steep climb back into town at the end but other than that, it’s flat and scenic. Be aware that running next to the river can be freezing cold until the sun warms things up. This year’s medal doubles up as a bottle-opener – which is always handy! Why Run It? I like potatoes almost as much as I like running marathons – so a marathon sponsored by one of South Africa’s largest potato cultivars definitely meets with my approval. What Else To Do There? If anyone knows of anything worthwhile doing in Frankfort (other than running a marathon) please let me know. Setting their joints at ease after the race (photo supplied). 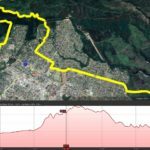 Race Description The ChampionChip timed JointEze Irene Ultra is a hassle-free way to get your Comrades qualifier done or improve your seeding – as your results automatically sync with your Comrades entry. It is one of only two ultras in Gauteng. The race starts and finishes in the local agricultural grounds with the meat of the race run through the Irene and Centurion suburbs. There is a long out-and-back section (13 to 27km) all the way to Fountain Circle which is ideal mental preparation for Harrison Flats. Although there are some long, steady pulls, the overall route profile is fairly even with the entire race run at an altitude between 1,400m and 1,500m. Interesting fact: JointEze came on as sponsor in 2018 and this has subsequently become the preferred qualification race for Rastafarian runners. Why Run It? A low fuss, hassle-free Gauteng ultra that brands itself as “#THEQualifier for Comrades”. How To Get There? The start is 50km (45mins) north of central Joburg with many access points but allow for race day traffic. What Else To Do There? Spend the day relaxing on Irene Farm (and depending on how fast you run you can enjoy a lovely breakfast or lunch on the tranquil grounds). After watching the cows on the farm, you can see the Bulls in action later that afternoon as they take on the Jaguares from Argentina. Race Description A flat two lap tour of Durban incorporating the city centre, promenade, harbour and point area. Why Run It? One of the few AIMS certified marathons in the country. How To Get There? 600km (6h) drive or 1h flight to Durban and 35km drive from King Shaka Airport. Note: Awaiting final confirmation of details from race organiser. Race Description With over 3,500 finishers this is one of South Africa’s big four ultras, a 50km point-to-point route from Middelburg to the Loskop Dam on closed roads. With the start 1,500m above sea-level and the finish 1,000m, it’s a fast, downhill route – but there are some tricky sections: there is a gradual climb to 1,600m all the way to the half marathon mark and two nasty hills on the second half (Bugger’s and Varaday’s) will give you something to talk about while you cool you legs in the Forever Resort pool at the finish. Why Run It? The finish venue in the Forever Resorts Loskop Dam is one of the best in the country. Shake hands with an Olympic Marathon gold medallist – if you complete 10 Loskops, Josiah Thugwane is usually on duty to hand them out (he still holds the men’s record – 2:44:03). What Else To Do There? Relax after the race at the Loskop Dam. Race Description The Chatsworth Freedom Ultra was started to commemorate the end of apartheid and dawn of South African democracy in 1994 – and has been going strong ever since. You get to cover almost every street in Chatsworth as you wind and grind up and down their undulating terrain. With long stretches along the Higginson Highway, this is a route that tests your mind and well as your legs – making this an ideal Comrades preparation run (Stephen Muzhingi has won the race twice and followed both victories up with a Comrades triumph). The route is something between circular and a double-lapper as there are several repeat sections. The highlight of the route comes towards the end – four shaded, scenic kilometres through the Silverglen Nature Reserve. Why Run It? Only the rash and reckless walk the streets of Chatsworth – but only the incredibly brave run 52km around her streets. This is a race that earns you serious street cred. If you are visiting from out of town, telling your Indian friends and work colleagues, “I am going on holiday in Chatsworth” makes for a very interesting conversation starter. How To Get There? 600km (6h) drive or 1h flight to Durban and 55km drive from King Shaka Airport. Accommodation Options Options close to the start: The Hotel Savera; Kams Lodge. Or check out Google for B&B and hotel options around Durban. What Else To Do There? Take a look at some of the magnificent local temples, relax on nearby beaches or check out the many Durban tourist options. 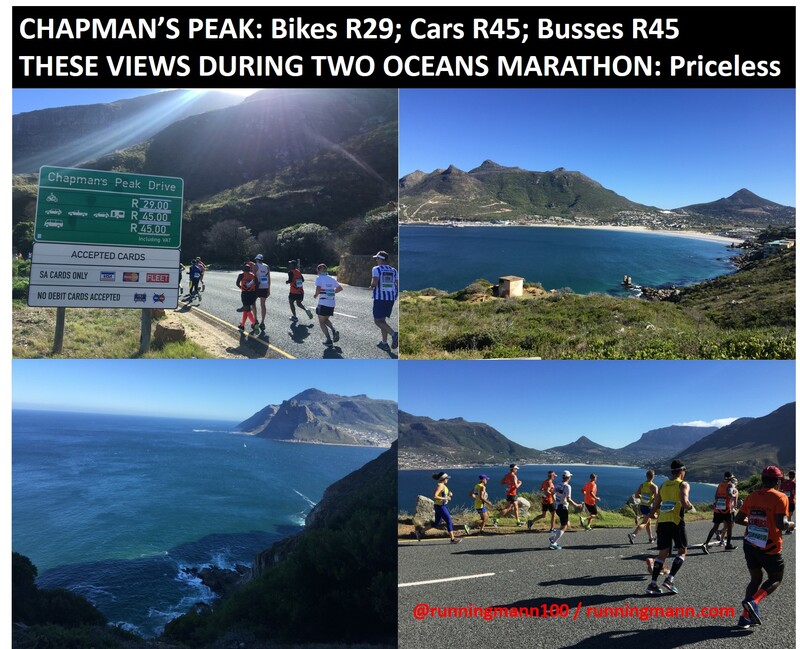 Enjoy the priceless views on Chapman’s Peak Drive during the Old Mutual Two Oceans Marathon. Race Description The second largest ultra in the world and my own personal favourite (I’m looking forward to my 17th voyage in 2019). After a flat first half through Cape Town’s southern suburbs and alongside the Indian Ocean, you get to climb one of the most beautiful passes in the world, Chapman’s Peak Drive. A drop into Hout Bay gets you to the marathon mark and this is followed by 4km of extreme nastiness called Constantia Nek. The last 10km are mainly downhill with a few bumps along the way until you reach the best finish straight in the country at the University of Cape Town. Why Run It? 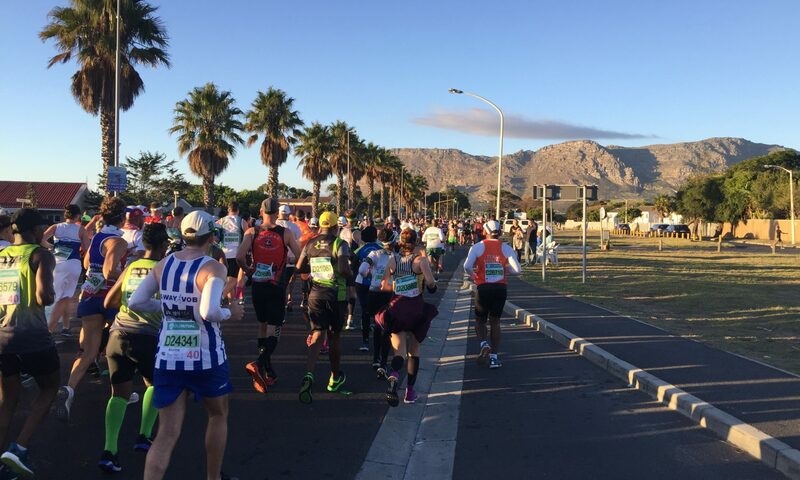 Take part in Africa’s biggest running event over the Easter weekend with six events drawing 100,000 visitors to the Western Cape including 3,000 international runners from over 80 countries. The highlight being the ultra – 56 magnificent kilometres around the Cape Peninsula. This year is going to be extra special at it marks the 50th Two Oceans voyage. How To Get There? Fly to Cape Town; 20km drive from the airport to Newlands. What Else To Do There? Cape Town is one of the world’s top tourist destinations. Check out https://myciti.org.za/en/home/ for options. Race Description I am told by my friend Julian Karp that this is the best double-lap marathon in the country – and with a marathon count approaching 800 he should know! The route is flat and easy through the sugar cane fields of northern Kwazulu Natal. This is just the second year that the event will be held and I’ll be making the trip to Pongola to see whether the support tables are as good in real life as they look on the club’s Facebook page. Why Run It? Pongola had the best goodie bag of any race in the country last year (see picture below). They are also developing local running talent by sponsoring entries and food for 50 underprivileged athletes. How To Get There? 425km (4h45) drive east along the N17 and N2. Accommodation Options See attached picture for discounted runners’ accommodation options. This is a late addition to the list – I don’t know too much about this one but will update with more information as I receive it from the organisers. # of 2018 Finishers ? How To Get There? 435km (5h) drive or 1h flight (approx R2,000 return) and 120km (1h30) drive from Kimberley airport. What Else To Do There? ? Race Description The route is a fast and flat double-lapper through Northmead, Rynfield and the beautiful Ebotse golf estate (for those who got their fill of Benoni in January, the route is completely different to Johnson Crane). There’s plenty of shade along the way making this an ideal route to test your legs and improve your seeding before Comrades. They separate the crazy people from the lunatics by adding a special 8km lap to end with 50km instead of a standard marathon (last year there were 771 crazy people and 401 lunatics). Why Run It? The only ultra option in central Gauteng. A great race to test your legs or improve your seeding before Comrades. How To Get There? The start is 40km (30mins) east of central Joburg with many access points but allow for race day traffic. What Else To Do There? Benoni is known for their golf courses and lakes. A lunch overlooking one of the lakes is a good way to unwind after your marathon followed by a visit to the local golf club where you might be lucky enough to catch a bout of the EFC ‘Dad Fight’ league. Race Description This race gives you a five-course feast that covers the diversity of the South Coast. 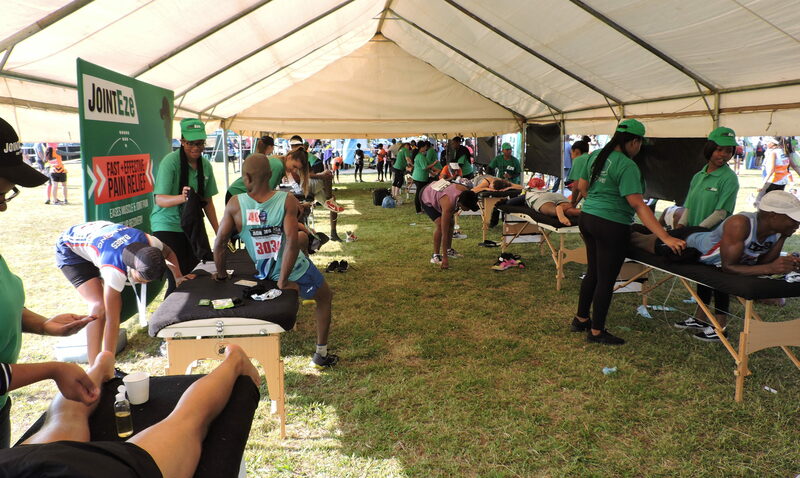 From the Ugu Sports and Leisure Centre you start with a series of demanding but beautiful rolling hills through rural Kwazulu Natal, after which you head into the bustling township of Gamalakhe and drop down to the coast at Uvongo. The exquisite coastal road to Margate is the easiest section of the route (and the year I ran it there was a whale basking in the bay). After soaking up sea-level serenity, you head back inland over several steep climbs that consume most of the second half of the course. If you finish this race feeling strong you’re in for a good Comrades, if not make sure you get all your affairs in order before 9 June. Why Run It? This is your last chance to run an ultra before Comrades and a great excuse for a long weekend on the South Coast. How To Get There? 700km (7h) drive or 1h flight to Durban and 170km (2h) drive from King Shaka Airport. What Else To Do There? With a plethera of blue flag beaches and tourist options this is a great place for a family holiday. See https://www.zulu.org.za/destinations/south-coast/hibiscus-coast for more. If you’re bike-curious (or just like looking at beards, tattoos and leather), the South Coast Bike Fest is the same weekend as the race. Race Description “The Wally” is named after the legendary Wally Hayward who won five Comrades from five attempts (1930, 50, 51, 53, 54) before returning as a 79-year old in 1998 (finishing in 9h44) and 1999 (10h50 and the oldest ever finisher). This is one of the most festive races on the calendar as Gauteng runners flock to Centurion for the last Comrades qualifier of the season. Expect plenty of banter amongst runners and nervous chatter (bordering on verbal diarrhoea) about June 9 plans and predictions. The two-lap route starts with some gentle climbs through leafy suburbs and finishes with easy downhills on wide open roads. As race sponsor, MiWay pull out all the stops to make this a memorable run (I understand that they have something very special planned for the start). Look out for the “What the Wally” crew for some great handouts, free photobooths to capture special memories, and mobile DJs to keep you rocking all the way to the finish (where some lucky finishers will get lucky draw entrance into the MiWay “Live for Now” lounge, getting a chance to rub shoulders with the winners and VIPs after their run). Why Run It? The best way to celebrate Workers’ Day is to run 42km around the leafy suburbs of Centurion before a forced reduction in your roadwork as you taper for Comrades. How To Get There? The start is 55km (45mins) north of central Joburg with many access points but allow for race day traffic. Race Description Circular route near King Shaka airport. Why Run It? Last chance to run a marathon in KZN until June 9. How To Get There? 600km (7h) drive or fly to Durban and 10km drive from King Shaka. Try to take it all in – a brilliant vista of lakes, lagoons, oceans and rivers during the Outeniqua Marathon. Race Description If this is not on your bucket list add it now. A superb small field marathon in the heart of the Garden Route. 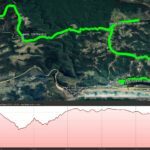 The route combines trail, tar and dirt road as you navigate the ancient roads cut into the Tsitsikamma forest between George and Wilderness. Expect hills, dams, lakes, lagoons, stunning sea views and indigenous forests. Why Run It? A beautiful marathon through indigenous Garden Route forest. How To Get There? 1,200km (12h) drive or 2h flight to George (R1,000 – R3,000 return). What Else To Do There? 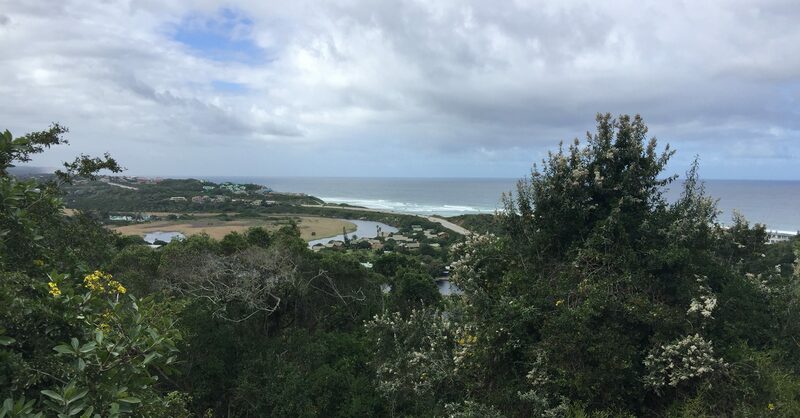 Wilderness is a brilliant family holiday destination, check out https://www.wilderness-info.co.za/town or take a holiday in any of the nearby Garden Route towns.